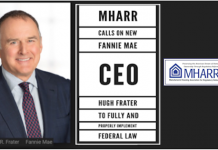 Attached for your review and information is a copy of a notice issued by the Federal Housing Finance Agency (FHFA) on October 3, 2018, seeking public comment on proposed revisions to the initial “Duty to Serve Underserved Markets” (DTS) implementation plans submitted by Fannie Mae and Freddie Mac to FHFA in 2017. 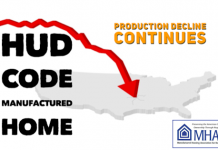 A link to the proposed modifications, which would directly impact the manufactured housing market, is contained in the FHFA notice. Please click on that link for relevant details. 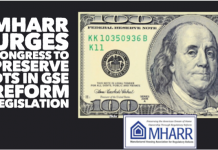 As industry members are aware, MHARR has been pressing FHFA, Fannie Mae, Freddie Mac, Congress and the Administration to provide for market-significant levels of secondary market and securitization support, by the Government Sponsored Enterprises (GSEs) under DTS, for the personal property or “chattel” loans which comprise 80% or more of the purchase-money consumer financing for HUD Code manufactured homes. 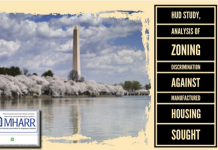 MHARR plans to carefully analyze these proposed DTS plan modifications, and will submit appropriate comments to FHFA. 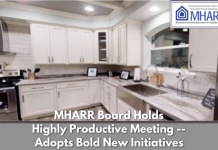 Comments on the proposed modifications must be submitted to FHFA no later than November 2, 2018. Today the Federal Housing Finance Agency is requesting public inputas part of the Agency’s consideration of proposed modifications to Fannie Mae and Freddie Mac’s (the Enterprises) 2018-2020 Underserved Markets Plans (Plans) under the Duty to Serve program. FHFA has determined that public input would be helpful in considering four of Fannie Mae’s twenty-two proposed modifications that would each make a substantial change to the content of its Plan. Freddie Mac has submitted one modification that FHFA considers to be a modest correction and, as a result, FHFA is not seeking public input on this proposal. All of the Enterprises’ completed “Plan Modification Request” templates (twenty-two from Fannie Mae and one from Freddie Mac). These documents will be published to provide the public with insight into the reasons the Enterprises’ changed their Plans. FHFA is issuing this Request for Input on its dedicated webpage, FHFA.gov/DTSthrough November 2, 2018. For more information and program updates, visit FHFA.gov/DTS.